Lamb is in season throughout April and May. Our lamb is from the Reay family farm at Ugley Hall farm in and raised to high welfare standards so that you can be assured of great quality meat that’s packed full with flavour. The most popular cuts of lamb, such as leg, shoulder and cutlets, as well as kidney and shanks and prepared in house for your convenience, however, please ask if you have any specific cuts you would like use to order in for you. Our delicious minted butterfly lamb and lamb chops are immensely popular! Lamb has a bold flavour that holds its own well with strong spices and seasonings, so is particularly delicious with Indian curries and African tagines. It’s great for slow cooking too. 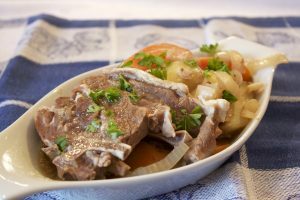 What’s your favourite lamb recipe? Please feel free to post it in the comments below.